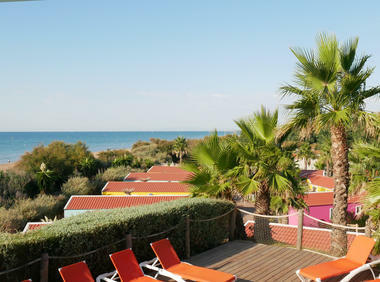 The Yelloh Village Aloha is a family campsite in Sérignan-Plage, in the Languedoc Roussillon region. The campsite looks out onto the Mediterranean and is situated 5 km from the small village of Sérignan near Béziers. 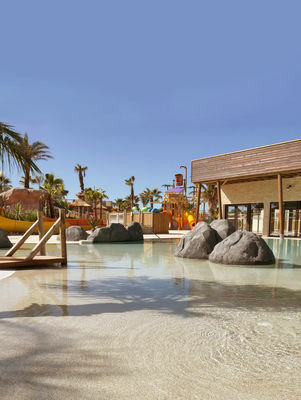 It includes a complex comprising 3 heated swimming pools and 2x 75 m waterslides. Alongside its gently sloping fine sandy beach which is perfect for kids, you'll find palm trees and a handful of beach huts. 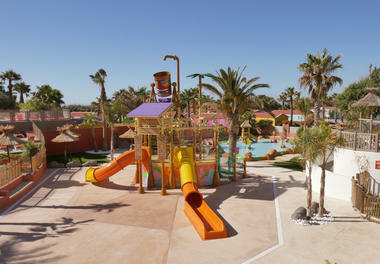 Aloha offers a total change of scenery and will help you rediscover the magic of a real holiday. We devote as much time and care to preparing the pitches as we do to the rented accommodation. We provide you with clean and regularly inspected toilet and shower blocks. The rented accommodation is comprised of wooden chalets or cottages near the sea offering maximum comfort. There is no review about Camping Aloha - Yelloh ! Village, be the first to leave one !